We continue to carry out the three ministry goals that we started with when we entered Hungary in 2011. But progress toward them has led to new opportunities, challenges, emphases and directions. Here’s how things look in the summer of 2015. Engage five Roma villages to begin using Community Health Evangelism to transform Roma into wholly healthy people in healthy churches in healthy communities. Ron and Zoli Padar lead a village meeting in Kisterenye to discuss CHE. The Lord of the Harvest is working in the Roma or Gypsy “nation” more than any other nation of Europe. But when Gypsies come to Christ their plight is still very desperate. They are the poorest of the poor, marginalized in society, despised, under-educated, unemployed, prematurely aged due to disease, hard life and bad habits. They are often without hope. After four years of ministry in Central Europe, we are more convinced than ever that the Roma and their communities need Jesus Christ PLUS Christian discipleship that is “wholistic” — touching every area of life: spiritual, physical, emotional, economic, educational, social and more. We have been sent out by the North American Baptist mission board, Fellowship Chapel and Community Health Evangelism (CHE) to connect Roma-focused missionaries, mission agencies, churches and denominations throughout Central Europe and the Balkans with the Bible-based, “wholistic” strategy of CHE. It was our original goal to begin five CHE Roma community development projects in five years. We are happy to report that God’s time-table is ahead of ours. We now have CHE teams and village development projects in process in 4 regions of Hungary as well as in one region in Romania and one in Serbia. Our new goal is that these will become Model Projects that will help start a missions movement toward truly wholistic mission to the poor that will produce wholly healthy disciples in wholly healthy churches in wholly healthy communities. With the other CHE ministries in our region, we have also actively embraced the goal of seeing CHE teams and projects established in all the countries of Central Europe and the Balkans by the year 2020. You can read about progress toward this goal in our “Happenings” folder. Assist Dr. Istvan Tatai and Rev. Zoli Padar of the Hungarian Reformed Church through preaching, teaching and outreach. A lesser goal for us is to do Evangelism and Discipleship with the network of Evangelical churches between Hatvan and our home village of Batonyterenye, Hungary. Dr. Istvan Tatai is the humble, gifted and very busy Hungarian Reformed Pastor of the Hatvan Hungarian Reformed Church. He also has oversight of 11 satellite congregations in villages that spread out over a 45 kilometer range. 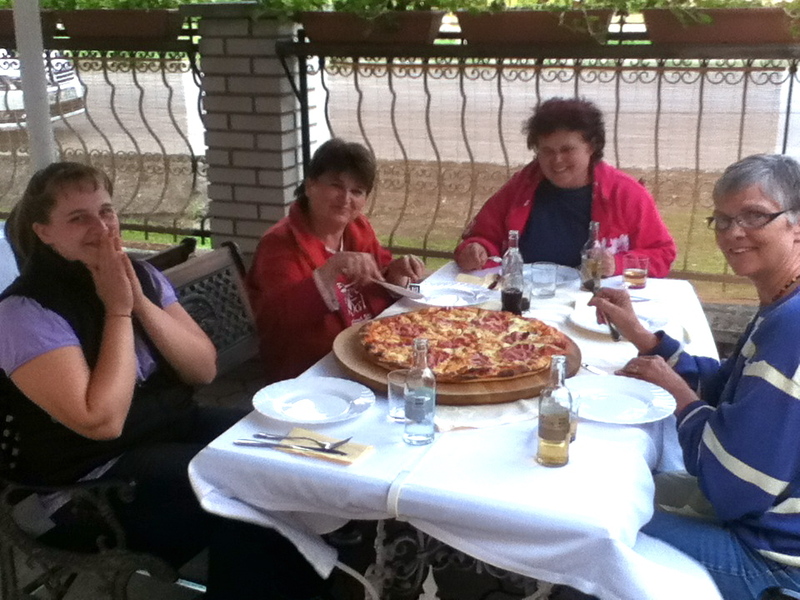 Jeanne teaches her ESL students in Batonyterenye how to enjoy pizza. Several years ago Fellowship Chapel helped build a worship center for the small group of believers here in the northernmost village of Batonyterenye and supported Zoli Padar as he received his seminary education. Zoli is now assistant to Pastor Istvan and oversees the church in “BT.” This is now our “home church” in Hungary. As we have time, we engage in the preaching, teaching and outreach efforts of the Reformed and Baptist churches of our area. 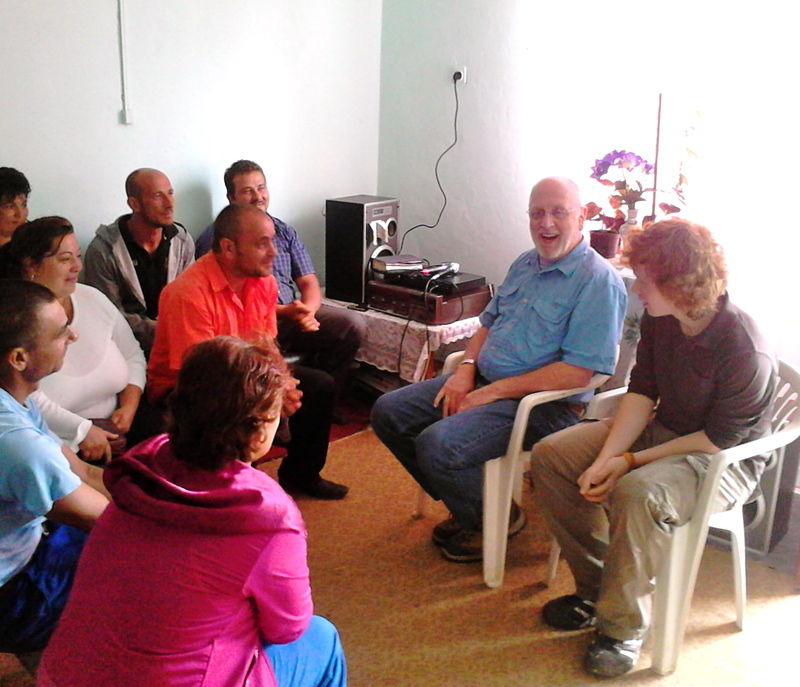 Be resources to the churches of Central Europe where we we are invited to partner in ministry. 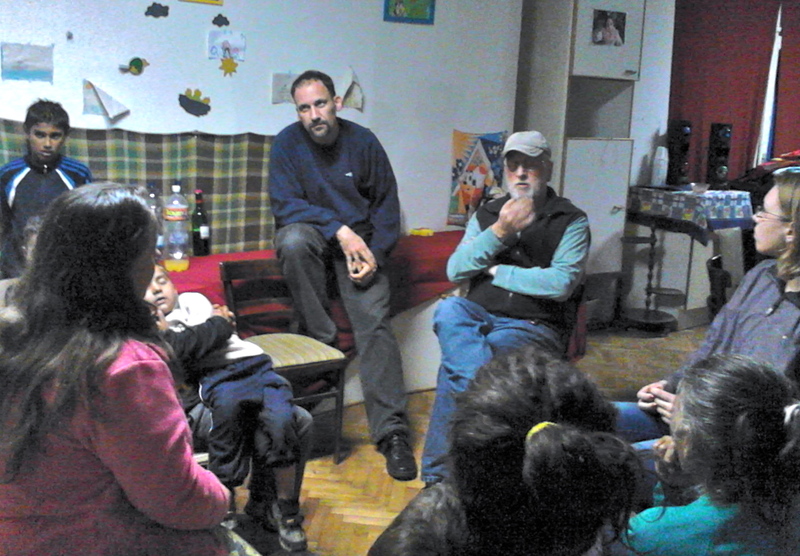 Ron teaches at a Roma Bible Study in Vaja, Hungary. We also utilize our specific gifts, talents, experience and abilities to help the churches of Hungary, Serbia, Romania and Central Europe grow in Christ. One of the advantages of age is that both of us have collected a lot of training, skills, experience and abilities along the way. We have also been given multiple gifts and talents that our Lord wants us to put to good use. Jeannie specializes in art and art education. She is also a wonderfully gifted people-person. Not even the Hungarian language can stand in her way! Just ask her ESL pupils. Ron has a rich background in pastoral ministry and is adept at mentoring, leadership training, speaking, networking and creative writing. He has extensive experience in writing, teaching, directing and performing Christian drama. Does one or more of our objectives interest you or fit into your own ministry strategies? Contact us and let’s discuss it.